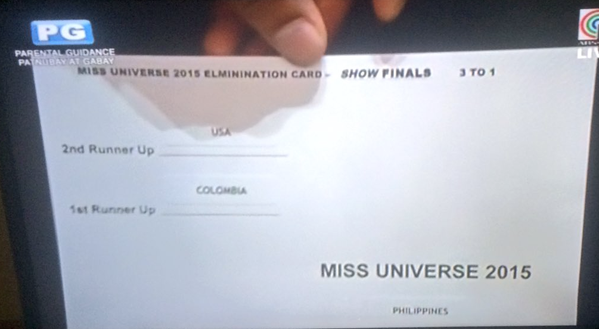 Miss Universe 2015 Elimination Card. It is immediately obvious that this card is poorly designed. In fact, upon first glance I would’ve likely made the same mistake that Steve did. Even if we ignore the poorly written copy– calling second place “1st Runner Up” feels like saying “first place loser”– the visual design leads a viewer to believes that Colombia is the winner. While attempting to use font size and alignment to show information hierarchy the design has fallen victim to the well-researched visual design phenomenon known as banner blindness. The misconception here is that the larger an item is the greater its perceived visual importance will be. Because the information has been split into two columns with the right-hand column center-aligned this text actually reads as less important, rather than more important. 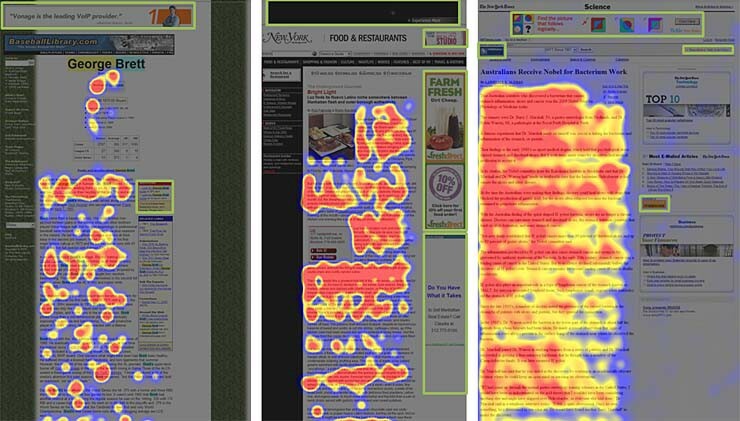 Heatmaps from eyetracking studies: The areas where users looked the most are colored red; the yellow areas indicate fewer views, followed by the least-viewed blue areas. Gray areas didn’t attract any fixations. Green boxes were drawn on top of the images after the study to highlight the advertisements. P.S. It has also been pointed out on Reddit that the word “Philippines” on this card is printed precisely where a user would likely place their thumb. Come on now, people. HH Design is a community for students interested in the intersection between design and technology.